After earning a “lucky” point against the Columbus Blue Jackets on Tuesday night, the Philadelphia Flyers currently sit in sixth place of the Metropolitan Division with a record of 9-13-5 for 23 points through the first third of the NHL season. The playoffs aren’t out of reach yet for this squad, but with each loss comes the crippling realization that this team might not be ready to compete past April 11. Stunning, I know, considering the make up isn’t much different from last year’s team that took the Eastern Conference Champion New York Rangers to seven games in their first-round matchup. Not all has been bad though for head coach Craig Berube and the Flyers in his second season behind the bench. Here are some of the surprises, and disappointments, through the first third of the season in Philadelphia. Ed Snider had a hunch that Jakub Voracek was going to enter elite status this season, but no one could have expected him to explode onto the scene like he has through the first third of the campaign. As of Thursday, the 25-year-old winger currently sits second in the NHL in assists (25) and third in points (34). Sure, Voracek showed a glimpse of this potential during the 2012-13 lockout season, putting up a near point-per-game pace in a 48-game campaign, but he’s transcended that production through the first 27 tilts this season. 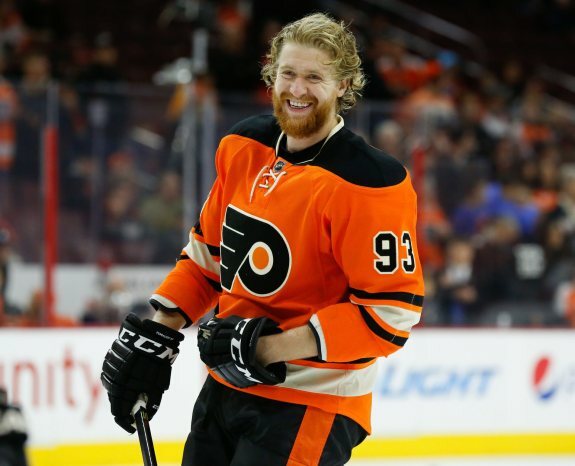 He and Claude Giroux form one of the top tandems in the NHL, but it’s become clear that Voracek is more than a by product of Giroux’s gifted abilities. It’s memorizing watching Voracek enter the offensive zone with such speed and ferocity, and his ability to powerfully fend off opponents while with the puck reminds me of another former Flyer and Czech countryman that plays for the Devils (*cough* Jaromir Jagr *cough*). However, will he be able to sustain this torrid pace throughout the season? It isn’t out of the realm of possibilities. Signed as a seventh defenseman in the offseason, Nick Schultz’s play brings back the memory of how good the blueliner was during his time with the Minnesota Wild. He’s been a viable top-four defense pairing since being inserted into the lineup in the second game of the season and won’t be leaving it any time soon. Schultz has been on the ice for only 19 total goals against (at even-strength and on the penalty kill) — including only six goals while playing the second most penalty minutes among defenseman. I don’t think anybody expected that type of production when the Flyers announced this signing. I briefly talked about him over the weekend, but the impact that Scott Laughton has made in his short stint with the club has been encouraging to say the least. Many weren’t sure if Laughton was ready for the NHL, but if he did make the team at some point, was he going to earn enough minutes to outweigh the time he’d play in Lehigh Valley? The answer? A resounding yes. The points haven’t come yet, but as his chemistry with Brayden Schenn and Wayne Simmonds continues to grow, so will the points. He’s also earned the trust of Berube, who now deploys him on the penalty kill, and he should be a staple down the middle for the Flyers for years to come. Signed to a low-risk, high-reward deal in the offseason, Michael Del Zotto was expected to be a part of the committee of defensemen who were going to emulate what injured blueliner Kimmo Timmonen produced on the ice. After a rough start to his season, Del Zotto turned it around and became one of the Flyers’ most effective players leading the break out and wasn’t a liability in his own zone. He’s been a healthy scratch here or there over the past few games due to inconsistent play, but the Flyers have already gotten good value for a deal they made, probably out of desperation, in the offseason. There were plenty of skeptics when the Flyers handed the then 35-year-old Swiss defenseman a four-year deal worth $21 million two summers ago. Over the previous few years on Long Island, Mark Streit showed signs of wearing down and was prone to injuries. Despite those issues, Streit’s durability hasn’t been questioned once with the Flyers. After an 82-game, 44-point campaign in 2013-14, the Swiss blueliner is still putting up strong numbers. With his four goals and 12 assists, Streit ranks in the top 20 among defensemen in scoring, helping the Flyers make up the production they are sorely missing on the back-end with Timmonen. He also has been outstanding with the man-advantage, helping the Flyers’ fourth-ranked power play sustain success without one of its biggest contributors. Entering 2014, Braydon Coburn was coming off one of his better all-around seasons for the Flyers, anchoring the top-defensive pairing with Timmonen a year after a dismal lockout-shortened campaign. 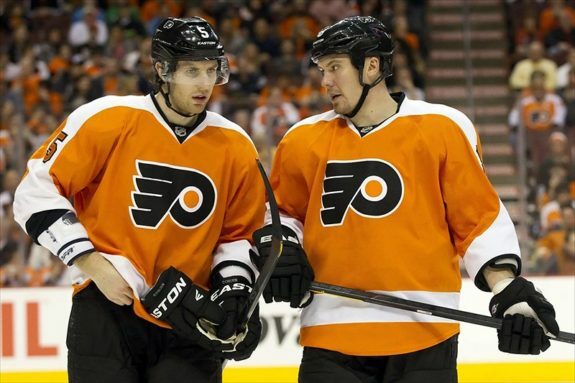 When it was announced Timmonen would miss an extended period of time — and possibly the season — with blood clots in his lungs and right leg, it was expected that Coburn would take the next step forward in his game and handle the responsibilities as a top-pair defenseman. But, just like his struggles when thrust into that role in 2012-13, Coburn hasn’t exactly fit the mold just yet. He’s lacked physicality in his game this season, and turnover issues in his own zone continue to plague him and the Flyers. He’s been a prime trade candidate over the past few seasons, but what kind of value would general manager Ron Hextall receive in a deal for Coburn? With the Flyers’ reliance on special teams, the penalty kill and power play have proven intregal to their success. The penalty kill has finished in the top 10 in the NHL over the past few seasons and players like Sean Couturier, Adam Hall, Coburn, Matt Read and Timmonen were some of the stalwarts that made the engine run. However, Couturier, Read, Coburn and Nicklas Grossmann have struggled mightily on the penalty kill this season. Philadelphia’s PK ranked 29th (74.7%) in the NHL entering Thursday’s contest against the Devils, but the unit has shown signs of turning it around. To shake things up, Berube added Laughton to the mix of penalty killers, which has led to a bump in success for his squad. Over the past six games, they’ve killed off 20 of the 25 penalties (80%) assessed to them, giving a glimmer of hope that the Flyers can turn it around while short-handed. A healthy scratch for the first time in his career, Lecavalier is an easy choice as one of the Flyers’ disappointments this season. Reports out of training camp were that the 34-year-old center was in great shape, and the former Rocket Rickard winner was expected to bounce back after an up-and-down first season in Philadelphia. Lecavalier opened with three points in his first three games, but after an errant Streit shot from the point struck the center in the foot, it set Lecavalier back to the point where he hasn’t looked like the same player. This isn’t saying that Lecavalier can’t figure it out and turn it around, a lot of other aging veterans have done it, and Lecavalier certainly possesses the skills to make it happen. But no one expected this future Hall of Famer to be a healthy scratch this season — let alone for five consecutive games. Acquired in the deal that sent Scott Hartnell to the Blue Jackets, R.J. Umberger was virtually non-existent throughout much of the early parts of the campaign. He never reached Lecavalier’s level and earned a seat up in the press box, but he was close. Umberger’s speed was one of the bigger selling points when the trade was made, but with a bevy of injuries over the past few seasons, many thought Umberger may be over the hill and his career could be done. The beginning of the season didn’t prove much different. As Hartnell flourished in Columbus, the microscope loomed large over Umberger’s poor start. However, the 32-year-old’s improved play lately could be an indicator of how he will be for the remainder of the season, and not the shell of a player we’ve seen before us. When Andrew MacDonald signed his six-year deal worth $30 million, it was a head-scratcher. His possession numbers aren’t that strong, he doesn’t have great zone-gap control but he does block a lot of shots. He was forced into the role of top-pair defenseman during his final season on Long Island, and he parlayed that into $30 million. However, it goes without saying that it’s not a good thing he’s been a healthy scratch this season. Did he come back too soon from his lower-body injury? It’s unclear if that’s the case, but if he’s already earning a seat in the press box in the first year of his big contract, Hextall has a bigger cap mess on his hands than expected. Is something wrong with Matt Read? A few of the Flyers writers seem to think so, and I’m close to hopping on board the “Matt Read is playing through an injury” train. The penalty-kill woes listed above could have something to do with the magnifying glass over his unexpected ineffectiveness with Sean Couturier as the team’s shutdown pair, but here’s the number that shows Read has the ability to turn it around – 4.4%. That’s the 28-year-old’s shooting percentage through 27 games in 2014. Owner of a career 15.1 shooting percentage, logic would lend you to believe Read is either injured or immensely underachieving. I believe it’s the former and expect Read to turn it around over the next 50-plus contests.